← Fall Into Dieting and Be Less Sick Too! We have a huge population of people in the U.S., who are also obese and eat Mexican food. So, is Mexican food fattening? The issue is that due to high prices in Mexico, the regular population cannot afford the vegetables and fruit, so they stick to the American Junk food items (hamburgers, soda, pizza) and the cheaper Mexican meals. Mexicans wryly call their foods of choice, “Vitamin T”–the tacos, tamales and tostadas. These foods anchor their diet and are much of the problem. Once reserved for special occasions, the carbohydrate and lard-loaded dishes now get gobbled daily. That wasn’t so much a problem in past generations, when most Mexicans lived on the land, worked hard physical labor and couldn’t afford a daily feast. These heavy carved foods are not meant for daily consumption. And the more sedentary lifestyles, combined with the ability to eat as if it were a party most days, has helped lead to the country’s girth growth. There are plenty of healthier choices like broth-based soups, fresh fish, salads, vegetables and fruits. But those tend to be more expensive for the Mexican poor and working class. And the heavier fare is just so good and addictive. Carbs are addictive. People who eat Mexican food this way on America are also facing a weight challenge. I went to a Mexican restaurant recently, after being afraid to eat Mexican food and I ordered a grilled chicken salad. It was delicious. 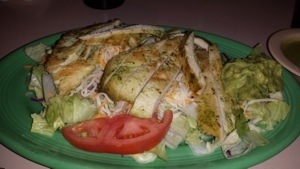 Lettuce, guacamole, cheese, tomato and seasoned grilled chicken–served with a guacamole dressing. I am pretty site my meals was under 10g of carbs, compared to a burrito with the heavily-carbed rice and beans, at 50 or 60g of carbs. My salad was tasty, filling and I will stay thin with it. I don’t want to go over 100g of carbs a day. This is the right way to eat and even the old school thinner Mexican way to eat. We need to learn that we can’t eat party style every day. We need to eat right and only eat Vitamin T on special occasions. IF anyone out there ever advertises and I make some money at this, I can do more. But, I have a day job and I do this in what little spare time I have. Thanks.